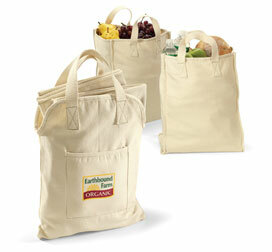 Help the environment by reducing your need for plastic or paper shopping bags with this organic cotton market set Set includes: Storage tote and 2 full-size grocery totes Storage tote features front pocket. Materials: 8oz. 100% organic cotton. (1) Frontpanel upper center 2W 2H (2) Back panel center 5.5" dia.